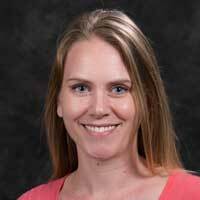 ST. LOUIS - Biology Professor Nicole Miller-Struttmann is the recipient of the 2019 Science Educator Award by the St. Louis Academy of Science, it was announced this month. The Science Educator Award recognizes a distinguished individual for outstanding contributions to science education or to the public understanding of science, engineering, or technology. Miller-Struttmann will be recognized at the Academy of Science’s 25th annual Outstanding Science Award, held at the Missouri Botanical Garden on April 4. According to the Academy of Science, Miller-Struttmann was selected because of her ground-breaking research, the numerous research opportunities that she created for Webster University students, and her work in creating science-based outreach programs for the St. Louis community. Miller-Struttmann is the Laurance L. Browning, Jr. Endowed Professor in Biological Sciences at Webster University's College of Arts & Sciences. She was hired in 2016 after teaching at State University of New York (SUNY). She holds a bachelor’s in science from Loyola University and Ph.D. in Ecology, Evolution and Population Biology from Washington University St. Louis. “The experiences and skills that Professor Miller Struttmann brings to Webster assists our students with a better understanding of the learning process and facilitates with connecting their classroom experience with the developments in the world outside the immediate university environment,” said Julian Schuster, Webster University’s provost, senior vice president and chief operating officer. During her time at Webster, Miller-Struttmann has made national news for her work into tracking bees through sound, the impact climate change has had on bees, research into beehive collapse, and bee behavior during solar eclipses. Most recently her work was featured in Smithsonian Magazine. She also has engaged with the public with science. Miller-Struttmann helped create the St. Louis Bee Brigade, which trains volunteers on how to photograph and identify various bee species in the region and then catalog them in a database that is shared by several universities. She also helped create the pollinator garden with the St. Louis Public Central Library and has worked with fifth and sixth graders and their science teachers in the area to teach the students the fundamentals of field research. To learn more about the science programs offered at Webster University, visit http://www.webster.edu/arts-and-sciences. For more information on the Academy of Science, visit https://www.academyofsciencestl.org/.